Bernie Sanders’ “revolution” isn’t good enough. He needs an actual plan for change. Bernie Sanders speaks at Roosevelt High School on Jan. 28, 2016, in Des Moines, Iowa. 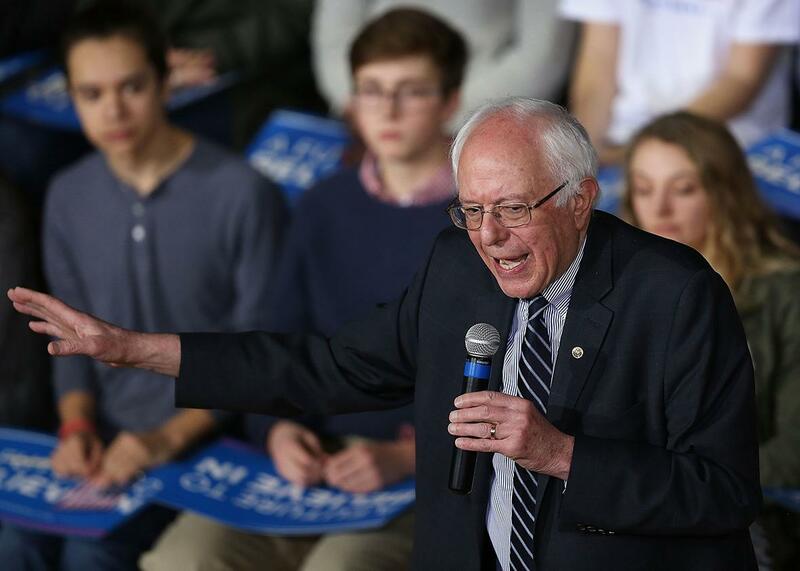 Bernie Sanders might win Iowa. The polling shows a virtual tie, and Team Sanders has built a formidable operation for turnout and organization. An upset over Hillary Clinton is possible, if not imminent. A Sanders win in Iowa almost certainly brings one in New Hampshire, and from there, the Vermont senator—the most successful “socialist” candidate for president in modern memory—will have a viable path to the Democratic Party’s presidential nomination. Which is why everyone, from backers to critics, should start to take Sanders’ theory of change far more seriously. At base, Sanders does not believe the American public is deeply split on key issues. Instead, Sanders sees a broad and unified public that’s stifled and trampled by the power of concentrated wealth, from Wall Street to big corporations and beyond. And so, when asked by a voter about gridlock and Congress—“What specifically will you do to overcome the resistance, cure the gridlock, and garner the necessary support to implement your initiatives and actually get something done in Washington?”—Sanders replied with his call to political revolution. If Sanders were still the gadfly—a minor message candidate without the support to win—this would be an OK answer. But, now Sanders is a contender. He could win, and represent the Democratic Party in a presidential election. While there’s no question that, as the nominee, Sanders will have detailed plans and proposals to present to the public, in office, these could crash easily against political and institutional barriers. As a contender, in other words, it’s not enough to have plans for what you will do. You also need plans for how you will do it, and Sanders’ “political revolution” isn’t enough. To be fair, there’s a logic to it. As Sanders adviser Tad Devine explained to the Huffington Post, “If he does win it is going to be such a shock to the system that we will not stop the fight the day he wins, we will pursue it vigorously.” In other words, the world where a self-described socialist wins the presidency is a world of tremendous political change, where untapped and new voters flood the polls to lift Sanders—and his Democratic fellow travelers—to victory. Still, there’s a problem, and the reason is straightforward. Yes, Wall Street and big business are powerful forces that, in many ways, have captured important parts of the American political system. But just as critical is the simple fact that Americans disagree. And they’ll continue to disagree, even in the face of a broad political movement. The closest analogy to Sanders’ revolution—the civil rights movement—inspired a backlash that reversed important gains and moved American politics to the right. To make a more practical analysis, a political revolution might put Sanders into the White House and win the Senate for Democrats, but it doesn’t change the landscape of House districts—where the Republican Party holds a firm advantage—and it doesn’t diminish conservative ideological intensity. In the wake of a Sanders win—as we saw in the wake of Obama’s 2008 victory—conservatives will push back. Sanders believes that he can persuade these voters—largely white and working class—through a robust economic message that appeals to their interests, and circumvents the racial and ethnocentric dynamics that shape American politics. That he can raise “political consciousness” and increase turnout by a whopping 20 percentage points, with most new votes falling for him. This movement would in theory transform politics, and in itself, lower the barriers to systemic change. Underneath this is the common liberal claim that working-class whites are “voting against their interests.” But are they? There’s no doubt that some have channeled their frustration and anxiety into a kind of cultural and symbolic politics. But just as many, perhaps most, are voting on principle. Their disagreement isn’t false consciousness, it’s a statement of sincere belief. They vote Republican because they care about guns and abortion as issues with their own importance (they’re not “clinging” to anything). They don’t want to sacrifice their vision of an ordered society to win economic equality. They want society to reflect their values more than they want particular outcomes. Even with a viable political revolution, a President Sanders would have a hard time persuading or budging a Republican House—still intact because of a powerful partisan advantage, cemented through gerrymandering and geography—that represents radically different, opposing values. The distance between his plans and their priorities is so great that it’s hard to imagine a world where the two sides can be bridged. You could pressure those Republicans through grassroots action, but they weren’t elected by the “political revolution.” Why would they listen? Indeed, when you take disagreement and political pluralism seriously, it is difficult to even conceptualize the revolution that Sanders describes and touts as the key to success. Does it emerge in America’s conservative bastions? Does it overcome decades of conviction, habit, and organization, the forces that gave John McCain and Sarah Palin nearly 60 million votes in an election almost designed to give a historic victory to the Democratic Party? The truth is that, even under the best scenario for Sanders—a growing economy, huge enthusiasm, and a weak opponent—it’s hard to imagine a world where he beats Obama’s total from 2008. Unless the revolution is truly that—a movement that overcomes partisan barriers—it, at most, leaves liberals where they were at the beginning of 2013. President-elect Sanders would enter the White House with gridlock ahead of him. And if the conservatism and moderation of places like Virginia and Missouri are any indication, then he would also face a split in the Democratic Party, among lawmakers who backed him and his socialist label, and those who ran from it. His campaign promises to challenge the establishment. Would these moderate and conservative Democrats challenge the establishment too? If they don’t, would Sanders challenge them? None of this is to say that Sanders would be a bad president, or that he couldn’t accomplish his goals through appointments, regulatory agencies, and executive action. He could. But America is a divided country, tens of millions of Americans disagree with liberal ideas and priorities, and our political institutions privilege this disagreement. As such, you can’t rely solely on a “political revolution” to pass your program. You need a real plan to show supporters—and the country—how you get from pushing universal health care or free college to making it a reality. If Sanders is going to avoid the mistakes of President Obama, then he needs to merge his movement—his outside game—with an effective inside one. Otherwise, you end up in a place that’s familiar to liberals and Democrats with memories of Jimmy Carter’s and Bill Clinton’s first terms and Barack Obama’s post-2010 presidency—where a promising administration gets mired in countless small battles, losing its focus as it dies a death of a thousand cuts. Which is to say that, for liberals and progressives, Sanders is important. They need a figure who works to push and expand the world of the possible in a positive direction. But there’s no such thing as a total victory and an unqualified win. Even with a movement at his back, Sanders needs a strategy. He needs tactics. And so far, he has neither.